Our littlest Stylemakers are busy dreaming, playmaking and building bright futures. It’s our role to gently coordinate their sense of style without completely losing the stage to Buzz Lightyear or Elsa in the process. Even when those die-hard phases chill out (and they do), Miss and Master bedrooms should reflect their own personal story. With a little planning and picking of battles, you can both be proud as punch to bring a playdate inside. 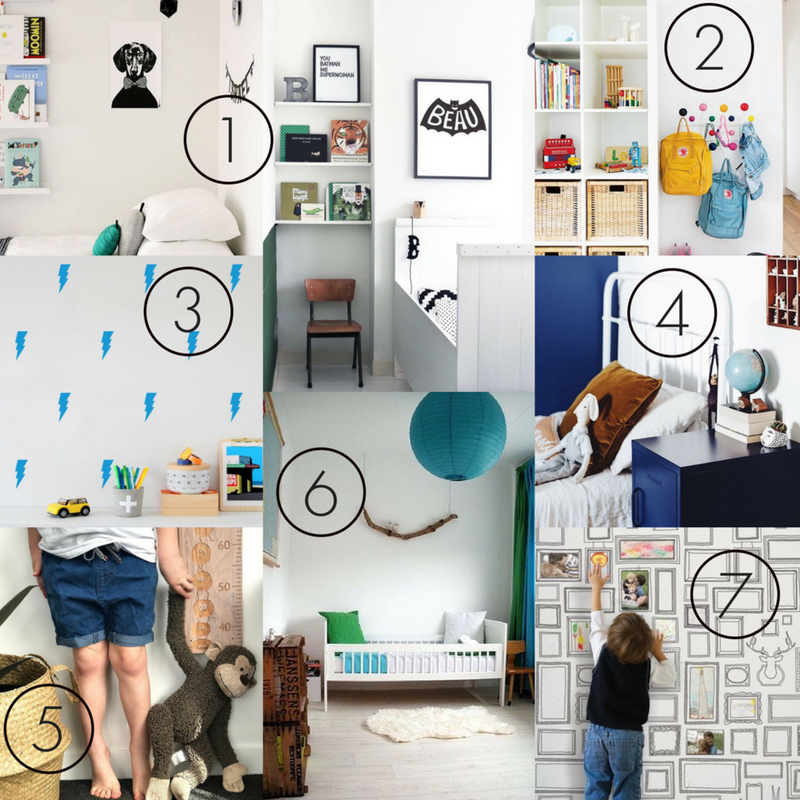 So throw on your cape, wave a wand or wiggle the nose… it’s time to boost your superhero status by creating a stylish, and like, totally #kewl kids bedroom. 1) Be Functyle - Functyle is a cheeky little blend of style and function, and while it can seem tricky to perfect the pair, the hack here is to think of nailing the basics first - bedlinen, window treatments and furniture. - The discipline of Superwoman will be required to shop on task and not be tempted by all the cuteness. Take a step back, pause, and identify exactly what the room requires before you spree. - Justify pricey furniture items by keeping them timeless - something that will last through all the ages and stages. Keep the price tag low when it comes to kooky colours or fad items, that way you both win. 2) Storage Savvy - Storage is a game changer. If we follow the tried and true adage of ‘a place for everything and everything in its place’ we quickly identify all the treasures, clothes, and even the rubbish that requires a storage solution. - Don’t forget to jot down the measurements. Turn it into a game, let your child run the builders tape, and then it’s your turn – measure twice, shop once. - If cupboard space is limited, metal lockers are a fantastic alternative and kids love them. Or wall-mounted timber boxes can be efficient little space savers, with style to boot. 3) Little Show-off - While you are shaping the next Picasso and losing space on the fridge, your darling will love having an area to showcase their latest creation. For a bolder impact, group all of those handcrafted pieces, paintings and drawings together in a dedicated area of the room. - While we’re showing off our arty side, remember to use wallpaper and/or paint to decorate sections of the bedroom without great expense. Instant artwork can be achieved using masking tape and paint. 4) Let’s Bedazzle - Now that you’ve measured every inch of space, shopped with precision and gone all neutral and sensible for the big-ticket items, it’s time to throw out the rule book and welcome in the garlands, bunting and all that other magical bling. Weaving in pops of handcrafted treasures, family heirlooms, or simply an on-trend print, can pack a punch without expense. - If the finishing touches mean staying tight to the animal, cartoon, or sporting theme, that’s okay just run with it. Your child will love you for it, the crush will fade and you can change it later. 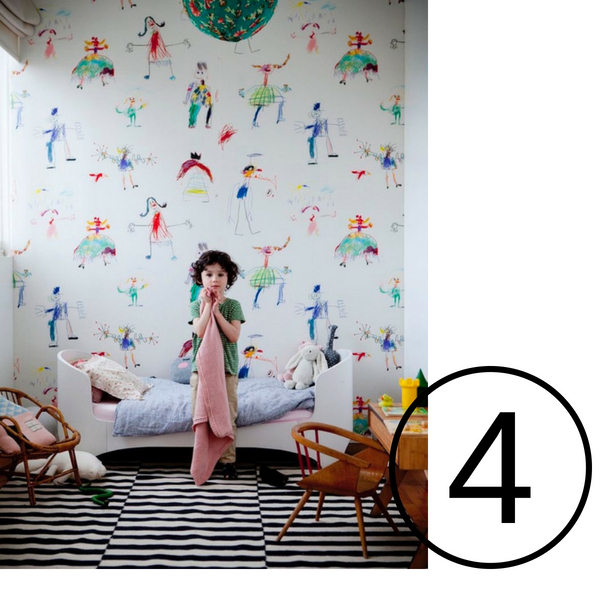 - Think like a child… thrill little minds with interesting wallpaper or decals, don’t limit it to the walls – the ceiling is another surface to express creativity, yet it’s easily forgotten. 7. My top wallpaper pick - Graham & Brown Frames wallpaper available at Guthrie Bowron $85.99 per roll, give the kiddos full freedom to draw to their hearts content. Amara Interior Blog Awards Win!